I grew up in Metro Detroit during the 1980s, and my childhood was very suburban. My parents would take me and my siblings into Detroit for a few Tigers games each year. The Red Wings were the Dead Wings until the late 80s, so I do not remember catching a game at the Joe until I was in my teens. We went to occasional Pistons and Lions games, but the Pistons were in Pontiac and then Auburn Hills, and the Lions had yet to move back to Detroit. I loved my childhood in Metro Detroit. I had woods to play in and swimming pools and sports to keep me occupied, but I longed for adventure. Until I reached high school, my only opportunities for adventure were our trips to visit my grandma’s house in rural Pennsylvania and our annual summer trip to the Les Cheneaux Islands in Michigan’s Upper Peninsula, or U.P. I remember the drive to the U.P. being boring, until we got close to Mackinaw City when my dad would offer a cash reward to the first person to spy the Mackinac Bridge's 552-foot-tall towers in the distance. My three older siblings and I always vied be the first to see the bridge, but I, being the youngest by several years, never won this contest until my older siblings lost interest in winning. However, win or lose, the majesty of those towers looming on the horizon always inspired awe within me. When I was a kid, the Mackinac Bridge was the longest suspension bridge in the world (it still ranks third). From the time Michigan became a state until the bridge was built, Michiganders had to take personal boats or ferries from one peninsula to the other, which seriously hampered both tourism and commerce. Beginning in the 1880s and inspired by the Brooklyn Bridge, Michiganders began debating the best way to join the two peninsulas. Several attempts to gain funding failed until construction finally began in May of 1954. It took 120 years, but Michigan’s two peninsulas were finally joined on November 1, 1957, when the Mackinac Bridge opened to traffic. As we crossed from the Lower Peninsula to the U.P., I was mesmerized by the enormity of the suspension cables and the sound of our tires humming on the open metal grid roadway. It seemed like we were gliding over the Straits of Mackinac and that the bridge would go on forever. The bridge was so impressive that I did not doubt my older brothers when they told me that MacDonald’s named the Big Mac after it. That made much more sense than "Mac" being short for MacDonald's, at least it did to a six-year-old who was so overwhelmed by the massiveness of the Mighty Mac. I had good reason to be impressed by the Mackinac Bridge. The bridge is an engineering wonder. It is 5 miles long, and the suspended portion of the bridge is 8,614 feet, or 1.63 miles. 3,500 men worked on the bridge during its three-year construction. These men and their machines built a structure that weighs 1,024,500 tons, has 42,000 miles of wire in its main cables and whose towers reach a maximum depth of 295 feet below water. These workers and the engineers who designed and planned the bridge did not have the benefit of modern technology to ensure that their work was completed correctly. Instead, they relied on 4,000 drawings and 85,000 blueprints, and they built it right. When we crossed into St. Ignace, we left the man-made wonder behind and gradually entered a land of natural beauty. Before we reached our destination, there was one last man-made “marvel” that I needed to see. 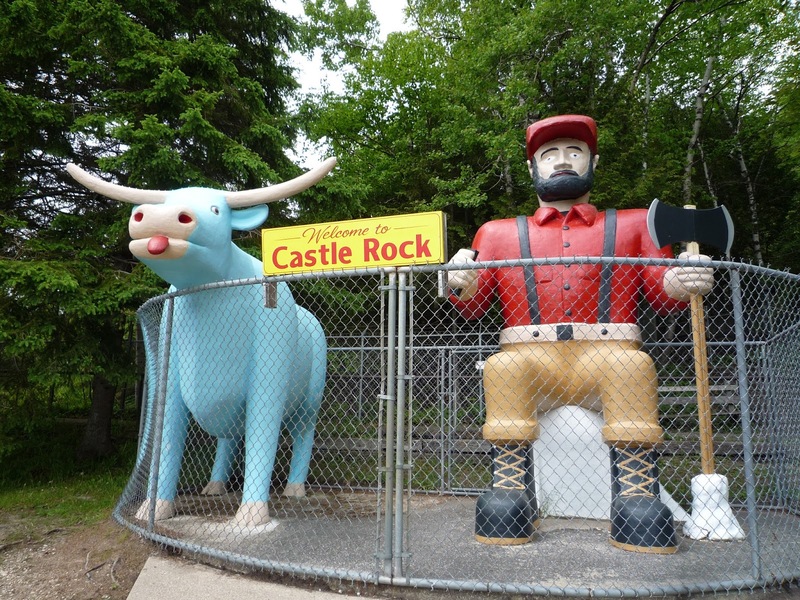 Soon after entering the U.P., my dad would challenge us to spot Castle Rock, again for a cash reward. Although I enjoyed seeing the rock jutting out of the trees, I was more interested in seeing Paul Bunyan and Babe the Blue Ox. The statues of these folk legends were so cool to a young boy, but when I look at pictures of them now, I am surprised that Paul and Babe are so hokey. Paul isn’t standing up showing off his brawny chest and axe-wielding muscles. Instead, he his sitting down with a blank stare on his face, almost as if he is watching his third consecutive hour of reality television. I guess he needed to chill out after a long day of cutting down trees. I ritualistically only listened to half of his admonishment. I would not run in...I would run off…to the beach, to the dock, to the woods, to adventure.